The big news this week is that Amelia now has braces on her top teeth. We went up to Scottsbluff early Wednesday morning for an 8:50 am appointment. That was quite the feat to get 5 folks ready to leave by 7:15 am. 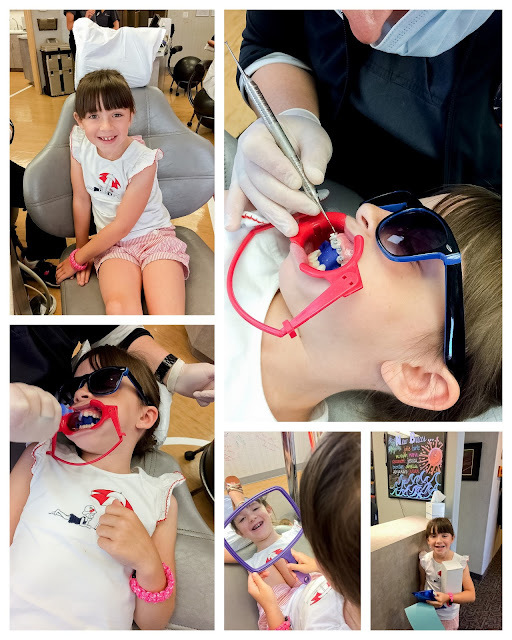 First the dentist checked her teeth then made a mold of her teeth/mouth to use when making and fitting the appliance and molar braces. The mold seemed like a terrible experience! Imagine stuffing a large tray of marshmallows into your mouth and not barfing for an entire minute. We left at 9:20 and had to be back by 11 am to fit the appliance and braces. The kids were good sports while I checked out the new Hobby Lobby. The kids stocked up on fun summer crafts and I got a pattern and material to make Pioneer bonnets. We went back and the Dentist adhered the braces, appliance, back molar anchors, and wires. Amelia chose pink and blue bands this time. She was quite excited about the entire experience. The pain did not start until later that evening. She discovered that eating with braces is an entirely new experience. Her teeth hurt so much that eating anything remotely hard is nearly impossible. Amelia is delighted that her favorite food of mac n'cheese remains at the top of her diet. She got some rice and refried beans for lunch. Since Wednesday she is taking lots of pain medications and eating like a mouse, nibbling a bit here and there. She carries her tooth care pack with her everywhere to brush her teeth and keep those braces clean. Flossing teeth with braces is an entirely new experience. She showed off her new braces at the first Activity Days activity soon after we arrived home. Her leaders hosted a fun BBQ at the park. We let the boys and Evelyn play at the park while Amelia had her activity. We went swimming nearly everyday this week. We went Monday to the local pool, swam in the wading pool on Tuesday, visited the cool water park/pool at Scottsbluff, Amelia went Thursday to Sterling, we all went to Sidney pool Friday, and then to Julesburg pool on Saturday. The kids are slowly honing their swim skills. Phillip is very adventurous and loves to swim underwater! Amelia learned how to fetch toys from the bottom of the pool this week, she loves to dive underwater now. Evelyn is still learning how to float around with the puddle jumper floaties. She is not fond of wearing them because she kicks her feet in front of her which flips her face up to the sky. I think she made some progress on Saturday because the pool had no baby pool so if she wanted to swim she had to wear the floatie. We went to wish Bella goodbye at her birthday party in Julesburg, CO. They are moving to Syracuse, UT this week. 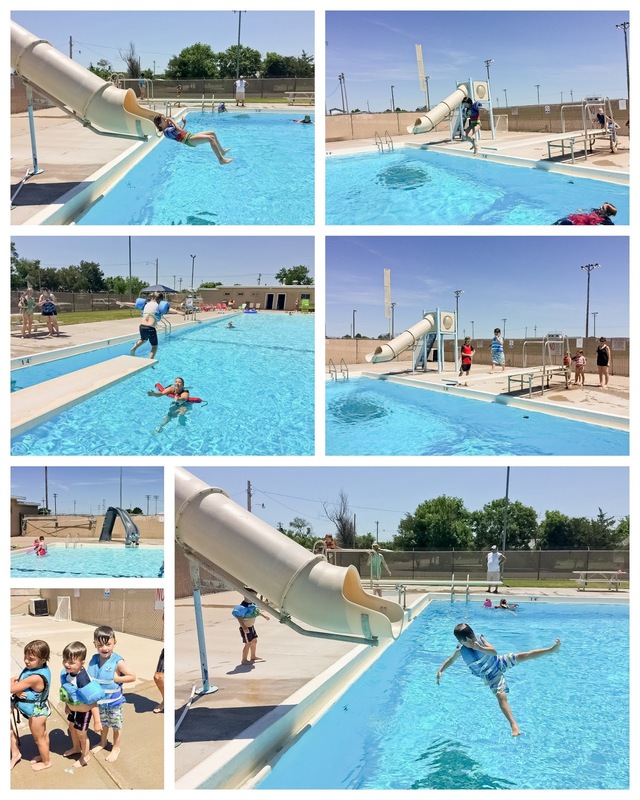 The kids were able to jump off the diving board because we had such a small group. A lifeguard stationed herself in the deep end catching kids. The three older kids jumped off the diving board most of the time. Monday was make something Monday. The kids made Justin Father's Day gifts for our creative day. Each kid made a puppet out of paper bags, sequins, and googly eyes. We made him a cute hand print art canvas. Evelyn got a hold of the sequin bag and dumped it on the carpet. That was fun to clean up. Thursday the boys did a little more creative play with a plaster dino kit we got in SB. I helped mix up the plaster and fit it in molds. The boys then painted all the dinos throughout the day. It was a fun activity to keep the boys busy while Mia was with Ella at the pool. Tuesday we went to Storytime park at the library, had lunch at the park while listening to super hero stories. Everett was totally enamored with the book "Bug Patrol." This week we hope to attend Super hero academy! The kids will be able to show off their hero skills. All my kids reached the reading goals this past week. I am so proud of their love for reading and books. After storytime we made bubble snakes. You take a water bottle, cut off the wider end, wrap and old sock around it and secure with a rubber band. I made bubble solution out of dish soap and water. The experiment worked amazingly well. We especially loved putting food coloring on the socks to make rainbow bubbles. 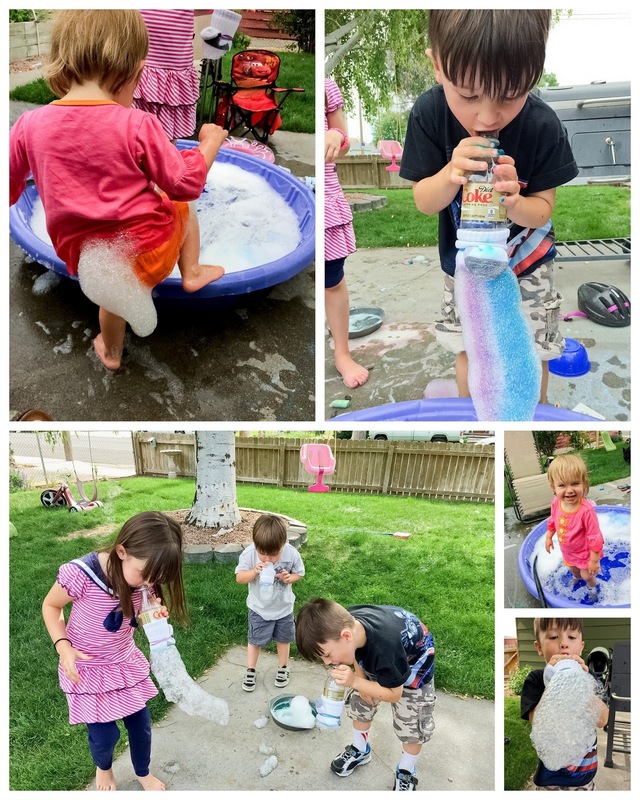 The bubble snakes worked even better when dipped in the pool to water down the solution. Amelia discovered that the snakes would stick to unsuspecting bums as a fox tail. Soon the experiment devolved into a delight of water, bubbles, and half-dressed kids. Evelyn had a nasty bum rash earlier this week. I finally let her run around in a spare pair of Everett's undies to allow her rash to air out. I think she drank too much pond water at Bridgeport Lake last week. Justin and I also dealt with similar digestive issues, we did not drink pond water so am now unsure where the distress stemmed from. The older kids set up a camp ground on the front lawn. 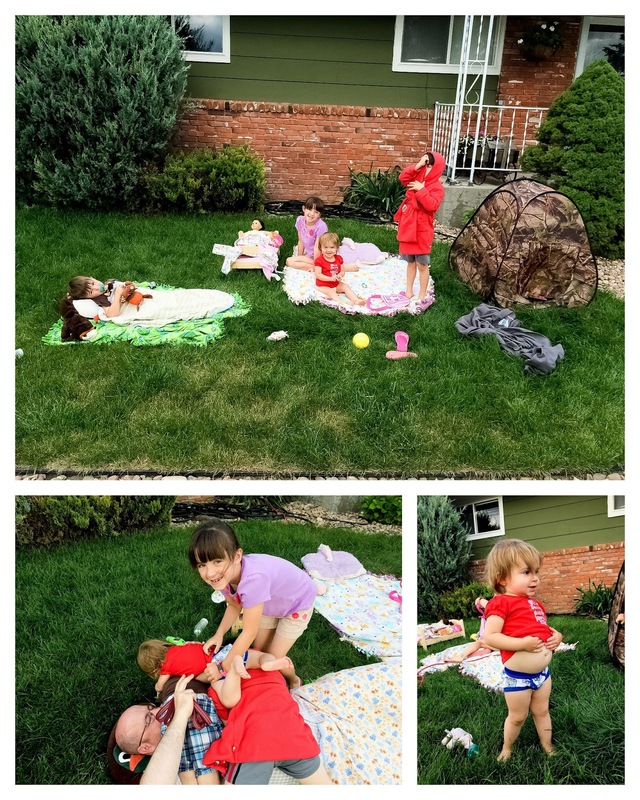 They played out in the lawn for several hours while pretending to camp. Thursday we enjoyed having lunch with ladies from the RS at the park. Alison brought fried chicken and the ladies brought side dishes to share. The kids were drawn to the busy road because of a nice hill they could roll down. Scared us mommies to see our kids so close to the road. Alison took Amelia and Ella to Sterling pool afterwards. Alison said the girls swam until 5:30 pm! No wonder Mia was so tired. Amelia got to play with Ella Tuesday night as well while Alison and Morley saw Jurassic World. Everett was stuffing his undies with rocks, the rocks fell out of his undies. It was quite obscene. I caught a couple motorists giving Everett double takes as rocks fell out of his pants. Friday we watched 6 extra kids while the parents went to see Jurassic World. Justin was a good sport! It was a little crazy with so many young kids. The Rognon's have duplicates of our kid's ages, the Campos have kids near Phillip and Evelyn ages so those two were in triplicate form. We walked down to let the kids play at South Elementary playground. Back at home the kids enjoyed popsicles. Evelyn shared hers with Annabelle. Evelyn also tried to give Annabelle hugs, they ended up as choke holds due to Annie's smaller size. Justin and I got to watch the same movie Saturday night. It was pretty intense. I think keeping dinos as extinct is a pretty good idea. I spaced another photo shoot on Friday. Evelyn got up at 5:30 again so we walked the town for 90 minutes. By 8:30 I was ready for a nap and fell asleep on the couch. When the doorbell rang at 9 I was unprepared for an early morning photo session. I asked the gentleman at the door if he was here to quote me a price to install egress basement windows. He was a bit confused! We were out of the door and ready 3 minutes later! Sheesh, my brain. The funny thing was I checked my calendar the night before and knew I had this appointment early the next day. Justin was spoiled this morning with the kid's crafts and breakfast in bed. True love is when your wife gets up and makes you sausage/bacon and egg English muffins. Amelia decorated his plate with a rainbow horse and fresh flower. Phillip carried a mug of milk. Everett yelled, "Happy Birthday!" while the other two yelled, "Happy Father's Day!" Phillip drew him a cute card showing off the front and back of his head, Phillip's resemblance was on the side. We sure love our Justin! He is a great Dad. Of course my Dad was also in my thoughts today. All his hard work and sacrifice to support 8 kids on military income. That is a miracle.